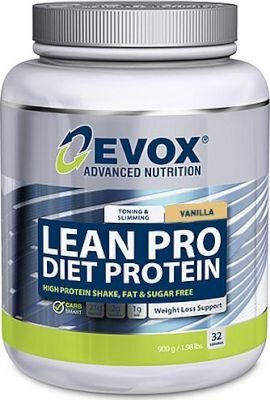 Lean-Pro Diet Protein by Evox is the ideal high protein, low carb shake for weight management. Contra-Indications: This product is not intended to diagnose, treat, cure or prevent disease. Do not use if any known sensitivities to any of the ingredients exist. Check with your doctor before use should you be on any medication. Consult a physician prior to use if you are pregnant or nursing. Do not exceed the recommended daily intake. UseInstructions: Take 2 heaped scoops (2 scoops = 28g) with 200 - 300ml cold water or skim milk. Add or remove water or skim milk to acquire desirable taste and thickness. Lean pro Diet Protein can be used to supplement your mid-morning and mid-afternoon meals and is best used for active individuals on a slimming or diet program.